Vermont is a state in the New England region of the northeastern United States of America. The state ranks 45th by total area and 43rd by land area at 9,250 square miles (24,000 km2). It has a population of 608,827, ranking 49th of all fifty states (surpassing only Wyoming). The only New England state with no coastline along the Atlantic Ocean, Vermont is notable for the Green Mountains running north to south and Lake Champlain which makes up 50% of Vermont's western border. It is bordered by Massachusetts to the south, New Hampshire to the east, New York to the west, and the Canadian province of Quebec to the north. Originally inhabited by Native American tribes (Abenaki, and Iroquois), the territory that is now Vermont was claimed by France but became a British possession after France's defeat in the French and Indian War. For many years, the surrounding colonies disputed control of the area, especially New Hampshire and New York. Settlers who held land titles granted by these colonies were opposed by the Green Mountain Boys militia, which eventually prevailed in creating an independent state, the Vermont Republic, which was founded during the Revolutionary War and lasted for 14 years. 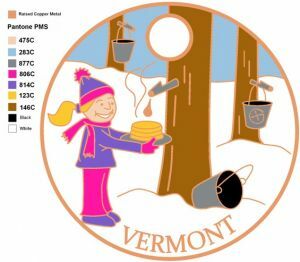 In 1791, Vermont joined the United States as the fourteenth state. The state is noted for its scenery and dairy products. It is the leading producer of maple syrup in the United States. The state capital is Montpelier, and the largest city and metropolitan area is Burlington. No other state has a largest city as small as Burlington. Need help with a custom Pathtag design?